The San Francisco Planning Department’s CEQA Review Procedures for Historic Resources, on occasion, require that an HRE be prepared for the purposes of gathering additional information "to determine whether a structure is a historical resource under CEQA and to access impacts on a historical resource." The CEQA Review Procedures detail the guidelines and outline the requirements in the preparation of such a report. Tim Kelley Consulting is certified as approved Historic Resource Evaluation (HRE) consultants by the San Francisco Planning Department. Our clients were the owners of a 1915 neighborhood commercial building that had been remodeled with a Moderne façade in the 1930s. The Planning Department required a survey of similar small scale Moderne structures citywide in order to establish a context for evaluating the project. We were able to do this within a modest budget thanks to our technically advanced methods. 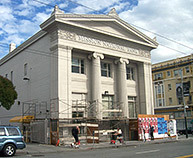 This National Register eligible Greek Revival banking temple had suffered great damage to its cast concrete cladding, which was both deteriorating and threatening to fall away on to busy public sidewalks. We were instrumental in identifying a preservation strategy that both satisfied the Secretary of the Interior’s Standards for Preservation and allowed an immediate remedy for the safety issues. The property owner needed to rehab his home, which though originally built in 1907, had been altered many times since. A small vocal group opposed his proposal, claiming it would ruin the historic nature of the property. In our report, we were able to demonstrate this was not so. The Planning Department agreed, but the project was appealed to the Planning Commission. We appeared before the Commission, who upheld our findings unanimously.